This goes to every single member of BloggingeHow family, we're super excited and stoked to Launch BloggingeHow Services section. We've been into Web Design services for our clients before too, though on the individual basis, which was not the perfect way to go as we all know. Knowing that we have to switch over to a Services page one day, I wasn't getting enough time off to get my head together to build one. Now that many of you know, unfortunately I'm going through a serious ankle injury, It was hard for me to even move. So taking this opportunity right on, I thought why not to take care of the due tasks for BloggingeHow family, for these days with a faster pace. Not only for me and my team, BloggingeHow Services would be a win-win situation for every single family member we have on board here. We would be regularly having discounts going on upon various services we're currently offering. I'm proud of BloggingeHow Team and I hope we would be able to match the high expectations of our readers and clients. Currently, We'll stay more focused upon Web Design services may that be a design over, logo restructuring, converting a PSD template to HTML etc. Below are few of the services we're taking start from and I hope that may Almighty give His Barakat into it. With Web Design Services, we're thrilled to give your blog or a website a new stunning look. I always love tweaking BloggingeHow's design every now and then and I'm sure there is no point of satisfaction any near. Me and my team would be super excited to help you in designing your web property in a way your readers would get addicted to it. I love helping my fellows out there for Free and I have always been doing it in any way possible. May that be via emails, social media etc. Its a pleasure when I hear, that my readers love when they get responses to their questions spontaneously. With Blogging Consultation, it doesn't mean that I would stop helping my folkes out there on Social media or via emails, though it's limited to the time I could manage. With a Personalized Consultation Plan, I could pre-plan a set time for my clients and give my entire energy to help them achieve their blogging goals, may that be lack of traffic, earning opportunities and what not! It's a world full of UN-tapped opportunities that we could together explore. 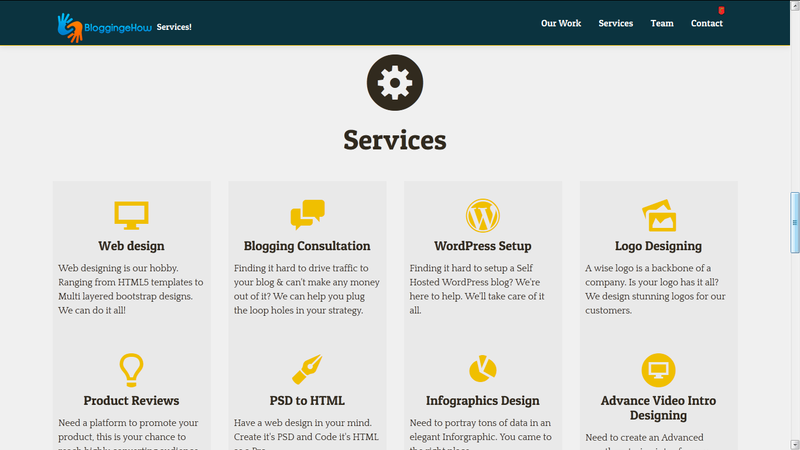 Many of you guys would already know about our current service which was to help our clients setup their Self Hosted WordPress blogs. The exciting part is, that it's Totally Free!. Which means, that we would take care of the entire WordPress setup process for you for Free when you get a Hosting Plan from BloggingeHow's affiliate link. This helps us get the little commission over the sale, with no additional cost to you. In response, my team would setup a WordPress blog for you for free. I love such Win-Win situations. A cheap looking Logo can ruin your entire efforts to impress your readers. So take the next step to make your blog/website more professional by re creating it's logo! It's one of the first thing i recommend to my readers when it comes to Design Overall. This is more for the advertisers who are willing to reach a wider targeted audience for their campaigns. They can request product reviews utilizing this very service. Converting PSD (Photoshop files templates) to a real life HTML website/blog. This is great if you sketch a website and it's layout before hand and later convert that into a full fledge blog/website. I was inspired by the latest blog design over by Pat Flynn of Smartpassiveincome. One of his friends, a web designer first designed the entire blog on photoshop and then later they converted that into a full code. 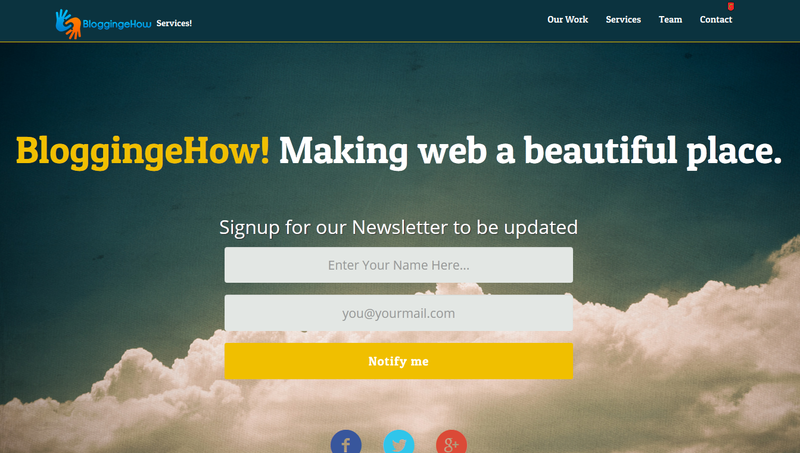 This is exciting and we're offering it on BloggingeHow services too! Info graphics are extremely popular to for viral marketing and we all know how fast they could blow up on social media. If you're having tons of information in your mind un-tapped, my team could create a stunning Infographics for your brand. Simply Convey us what you're looking forward to and leave the rest to us. Video Intros are exciting and grabs the attention of the viewers. Did you notice the video intro of AskHassam.com video cast episodes? The moment you add on the power of Video Intros to your videos and clips, their authority increases by millions. Contact us today for a stunning Video Intro for your brand. You can Shoot Us a message by Contacting Here while targeting any particular service. Make sure that you mention a specific service name that you are willing to get your hands on. This all wasn't possible with out you guys and I can't say it enough. You guys are the bomb! Thanks for everything brothers and sisters! May peace be upon you all!